The new Stella Pro 5000 RF and Stella Pro 8000 RF feature wireless control to further streamline the workflow of on-location content creators. We pride ourselves on updating our products to keep up with the demand of today’s photographic, video, and broadcast professionals. The Stella family is a range of portable, battery-powered, waterproof and/or weatherproof, light-weight, fast charging, and powerful continuous LED lights that can be set up in seconds. Now with wireless control, Light & Motion Stella products are sure to become even more of a favorite among on-the-go content creators. Heeding the call of professionals requiring increased flexibility, Light & Motion is proud to announce their new Stella Pro 5000 RF and Stella Pro 8000 RF single-point LED lights that now add complete wireless control to their list of features. This means on-the-go content creators are now free to mount these extremely portable, weatherproof, rugged 5600K lights anywhere they can imagine with no need for DMX controllers or external wireless RF modules. Leveraging an exciting new technology partnership with Elinchrom, a pioneering lighting company known for their broad technological capabilities and renowned light shaping tools, Light & Motion has incorporated the Elinchrom ‘Skyport® Protocol’ into these two new Stella Pro RF units. The Stella Pro 5000 RF and Stella Pro 8000 RF (with integrated Skyport® Transceiver) are controlled by the EL Remote Control for Stella, a wireless, 2.4 GHz remote control designed specifically for working with continuous lights compatible with Elinchrom's Skyport® Protocol. With Elinchrom’s Skyport® Protocol, the RF Control for Stella provides users with 20 channels, 4 separate groups, and the ability to turn the unit on and control its power from 0 to 100%. In addition, it is also capable of controlling up to 20 lights at a range of up to 656’/ 200m outdoors and 197’/ 60m indoors. 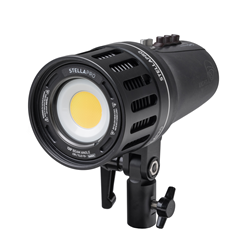 This shared technology also potentially allows the Stella RF lights to be controlled by the new Speedmaster L858D-U with the Elinchrom/Phottix module and the Litemaster Pro L-478D-U-EL. Stella lights from Light & Motion are fast becoming the light of choice for on-location professionals seeking cord-free, rugged and weather resistant lights outputting high-quality light. In an effort to make workflow even more streamlined, they have updated the user-interface of the Stella Pro 5000 RF and Stella Pro 8000 RF to decrease set-up time and increase productivity. An intuitive, three-button interface now provides faster, more precise output control, while allowing for easier navigation of the settings menu. In response to popular demand, Light & Motion is offering a new Stella Pro 5000 RF Action Kit and a Stella Pro RF 8000 Kit. Housed in a custom Tenba BYOB + Packlite Bundle, they will include the new Elinchrom EL Remote Control for Stella plus all of the necessary mounting accessories and light modifiers to help content creators take full advantage of this game-changing light, now with the ease of radio control. The Stella Pro RF units will be available in June 2017. However, pre-sale is available beginning 4/24/2017 at StellaProLights.com and select participating specialty dealers across the United States. Since 1962, Elinchrom has been producing the world’s most portable lighting gear, drawing from a heritage of more than 50 years of innovation. Based in Renens, on the shores of Lake Geneva, Switzerland, Elinchrom continues to innovate with a product range that covers every photographer’s needs, from compact flash equipment to battery and power pack systems, reflectors, softboxes as well as numerous lighting accessories. Elinchrom’s lighting equipment is used around the world for both studio and outdoor purposes.